Mongua is a municipality (since 1997) in the Colombian Department of Boyacá, part of the the subregion of the Sugamuxi Province. The flag of Mongua is horizontally divided green-blue-green with a diagonal (bottom houst to top fly) white stripe charged with a yellow sun. On the canton there are Chinise-like red five stars. "The flag of the municipality of Mongua is made of three horizontal stripes green, blue and green, and of a diagonal white stripe. The green stripe symbolizes the greenness of its fields and fertility of its soils. The central stripe is equivalent to the half of a green stripe. The blue stripe recalls abunance and limpîdity of its waters, the white stripe, equal in width to the blue stripe, and running from the upper right corner to the lower left corner, symbolizes peace and faith. 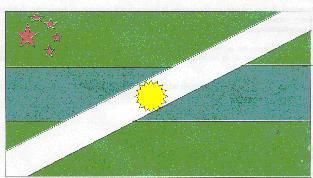 In the intersection of the white and green stripes is shown a rising sun recalling the name "Sol Naciente"* (Rising Sun). In the upper stripe near the hoist are five stars, a bigger red star representing the urban perimeter and the central hamlet, and four smaller stars representing the other rural hamlets** ("veredas")." * The name of the municipality comes from the Muisca elements "mon" and "gua", reading "Sunrise" or "Rising sun"; the first settlers of the place belonged to the Mongua tribe. ** Duce, Monqui, Siquaza and Tunjelo. The image does not completely match the description. Accordingly, the proportions of the horizontal stripes should be 2:1:2.